We were recently posed with a question from the field as to what to correctly call our product line. We repurpose steel shipping containers and these versatile boxes have a long history of origin and have had a number of terms associated with their longevity of use such as Sea Can, Conex and Connex. We have written about the history of containerization in a few of our Boxpert blogs this past year. The history of containerization was summarized in our TedEd blog and we expanded on the Globalization and Containerization story in another blog. As we discussed in our past posts, the origin of these standardized steel shipping containers began in the 1950s when commercial shipping operators and the U.S. military started to develop these units. The logistics method employing these was named Container Express and was abbreviated ConEx. That abbreviation evolved into a word used universally and has since been abbreviated Conex. Often the term has evolved from its origin to Connex and this term is also used interchangeably. These 20-foot and 40-foot steel storage containers or conex boxes are also termed as Intermodal Containers or ISO containers. This industry term refers to the the International Standards Organization (ISO) who is the largest developer of international standards and is the organization who developed the standarized dimension specifications for the steel shipping container use worldwide. The design of the container allows for intermodal shipping allowing for movement of the container from one mode of transport to another (ship, rail, or truck) without unloading and reloading contents of the container. With the transport of these conex boxes across the globe via our oceans, regional terms have also been adopted, as in the case of the term Sea Can. Conex boxes are predominantly manufactured overseas, mainly in China. These structures are then transported via freight liners stacked on top of each other filled with imported products destined for US and other world ports. Our visit to China was highlighted in our newsletter this fall where we shared our experiences and some industry information on the origin of these structures. 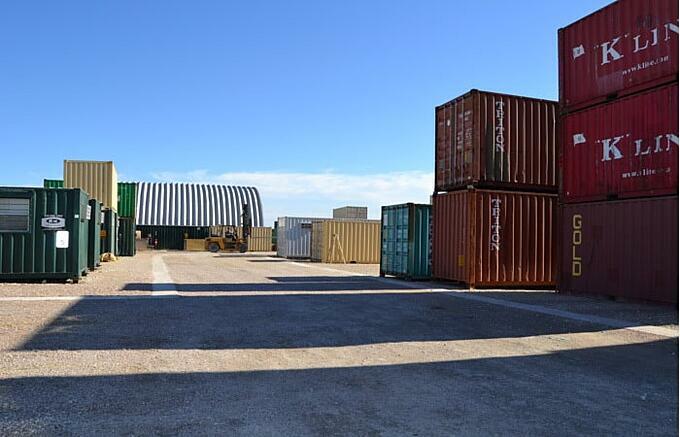 Here at Falcon Structures, we have coined our own terms, for our wide variety of products.Our Storage Container, Jack and Jill Living Container, Work and Store Container Office, and 40-foot Locker Room all begin with a Conex Box and modifications are done to develop the structure for a variety of uses. Whether you use the term ISO Container or Conex, we know exactly what you are looking for. Want to learn more? Check out our follow up blog post, Shipping Container Terminology Part 2: Materials and Components.